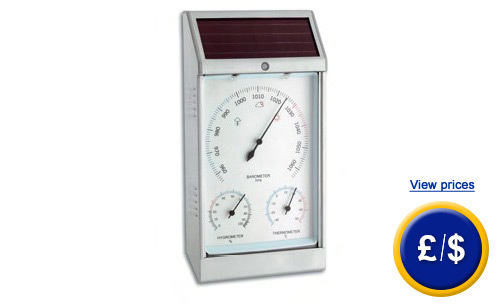 Outdoor weather station with barometer, thermometer, hygrometer, made of stainless steel. An analogue outdoor weather station in modern design with 3 good readable displays. On the change of air pressure a prediction about weather condition can be achieved. This will also be displayed via 3 symbols on the barometer. The analogue weather station will not only show the viewer current weather conditions but also please the viewers’ eye with its design. This is not only an accurate measuring instrument, but also the best material is used for this weather station. This outdoor weather station contains automatic lighting with its light sensor. Due to its solar cell the rechargeable battery included in delivery can be recharged in an environmentally-friendly way. Should you require any assistance in finding the outdoor weather station you are looking for, do not hesitate to contact us on: UK customers +44(0) 23 809 870 30 / US customers +1-410-387-7703. An overview of all weather stations can be found here: weather stations. Our technicians and engineers will gladly give you advice on this baro thermo hygrometer and all other products in the field of measuring instruments, regulation and control and scales.